Hi Skopje Hostel is located in the comfy GREEN zone, at the base of Vodno Mountain, outside hustle and crowds, yet a 10 min. walking distance from the center of Skopje. Its location on a hill makes the place secure and perfect because of the fresh air, the sunrise side and the wonderful panoramic view of the city. Near the hostel there are many supermarkets, ATM's, pharmacy, hospital, police station, exchange office, bakery and all city attractions like shopping malls, restaurants, bars and nightclubs are only 10 minutes walking from the hostel. The best location ever dreamed for a hostel, totally focused to the international traveler. Our friendly, helpful and multilingual staff is available 24 hours a day, and can help with any inquiry. We have updated information about tours, points of interest and local entertainment, as well as free city maps and tour maps. With its own garden of 600m2, Hi Skopje is one of the few places in the city, where you can relax, have a nice stay and meet new people and cultures. The warm atmosphere in the garden is enriched with summer cinema and lounge parties. Its own natural beauty, with hundreds of plants, inspired us to describe the 4 elements of the nature within the hostel. Hi Skopje has clean and comfortable mix dorms and private rooms, and each of them has element that represents the natural beauty of Macedonia. In every room for each bed we provide safety lockers and reading lights. There is a large multi-purposed room, with PC, Wi-Fi internet access, full equipped kitchen and a cozy fireplace, where you can share your traveling experiences. The place is secured with camera and security system. 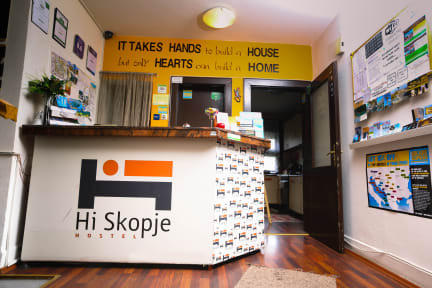 Hi Skopje Hostel is a really good place to stay if you come to Skopje. The hostel is nice and clean, well equipped and the host is a great guy who makes you feel at home. It's a 20 minute walk from the city center, which in my opinion is a worthy trade-off for the great price, and its location is also beneficial if you're planning to climb up to the Millenium Cross like we did. Oh, and the lovely doggo is a bonus! This hostel is wonderful. Such an accommodating atmosphere. Great staff, very comfortable, make you feel at home. Loved my stay here and can’t recommend them highly enough. I really enjoyed my short stay at the hostel. The rooms were nice and I got great tips for food and things to do. The dog Jilay is also super friendly- It’s a nice walk into town. Great Staff and great Hostel. Not in city center but near to Mount Vodno hike starting point. Would stay there again. Top spot. Just one thing. It's a bit out of town. And halfway up a mountain. But this kind of adds to the experience. There is a lovely eatery nearby and most people staying at the hostel chill and go there. One of the best places I have stayed in quite a while. Very quiet and really helpfully and welcoming staff, who run a tight ship. Amazing cosy atmosphere and lovely garden - it's like being at home. The staff go out of their way to help you and are so welcoming. We really enjoyed our stay but we did find it a bit of a hike into town.